Would you like a call when auroras appear over your home town? Sign up for Spaceweather PHONE. SUNSPOT WATCH: If you learned how to safely look at the Sun last week to see the transit of Venus, look again. Two big sunspot groups, each larger than Venus, have emerged over the Sun's eastern limb. This could signal a period of increased solar activity in the days ahead. TRANSIT OF VENUS: Some of the pictures of last week's Transit of Venus are unlike any in the history of astronomy. There's the X-ray Transit of Venus, recorded by an Earth-orbiting satellite; a jet airplane transiting Venus while Venus transited the Sun; Venus' atmosphere glowing like a fiery-red ring; and Brood X cicadas watching the transit--for the first time since the 8th century. Above: The transit of Venus, captured by NOAA's Solar X-ray Imager (SXI) onboard the GOES-12 satellite. Says Steven Hill, the SXI team leader: "Most of the benefit from watching the transit with SXI will be better characterization of the SXI instrument itself, e.g. point-spread and scattered light. This will improve space weather forecasts." Also, he says, "it might be possible to determine the X-ray radius of Venus and compare that measurement to an expected value based on a Venus atmosphere model. Given the in situ measurements of spacecraft like Magellen, it is unlikely, but not impossible, that we could produce some new information." "Last night was fresh, so dew formed on the grass and on the numerous spider webs," says Laveder. 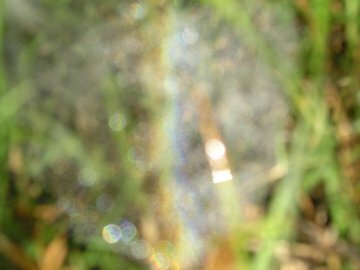 "The tiny dew droplets scattered the morning sunlight, forming this small rainbow. I had to focus to infinity to capture the 'bow; that's why the picture is fuzzy." Editor's Note: This site is sponsored by Science@NASA. Space weather and other forecasts that appear here are formulated by Dr. Tony Phillips. They are not guarantees of space weather or other celestial activity. You are visitor number 32637591 since January 2000.